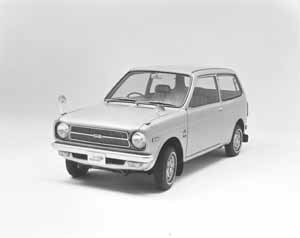 Van version was introduced on 1971-09-06, followed by hatchback wagon on 1971-10-25. This van type variant uses a 360 cc, 2-cylinder water-cooled engine. The high back body increased its centre of gravity compared to the sedan version, making it easy to roll over under crosswind. The van was first sold on 1972-09-20, at the price of 376,000, 388,000, 403,000 yen for standard, standard (after production of Life pick up), Super DX respectively. Total 17,165 vehicles were produced. Introduced on 1973-08-21, the vehicle used the style of a pick-up truck. The production was ended in 1974, with 1132 vehicles produced. In 1997 the Life name was resurrected for a new line of small, front wheel drive 5-door MPV style cars for Honda, which required a redesign for 1998 because of new Japanese taxing regulations. The 1998 model was bigger than the 2nd generation counterpart, with 3395 mm (133.7 in) length and 1475 mm (58.1 in) width. In 2003 the model was updated, and now includes a 660 cc 3-cylinder engine, with an optional turbocharger, mated to a 4-speed automatic transmission and optional 4-wheel drive. The safety features were significantly improved and engine emissions were reduced. A triangle window was placed at the mounting point of wing mirrors in 3rd generation vehicle. In 2005, Honda introduced the DIVA model, which included aerodynamic styling and aluminium wheels. 2007 models started production on 2006-10-05. It marked the first use of Honda Smart Parking Assist System in a production Honda vehicle. In November 2008 Honda introduced the fifth generation Life. This generation is available in three flavours: Life G, Life Diva and Life Pastel. StepVan room contain information on Step-Van.